VirtualCallSystem is one such splendid service that utilizes the power of the internet and VoIP technology to meet the communication needs of any business. The highly sophisticated features of VirtualCallSystem enable companies to set several call handling options, mainly based on the time of the day, the number of the caller, the extension and a wide range of other scenarios. The Nevada-based company has more than 40 years of telecommunication experience, with staff from former AT&T Corp visionaries. VirtualCallSystem literally outperforms even the most costly PBX systems available out there. The company simply aims at making business communications smoother than ever. VirtualCallSystem offers top-notch virtual PBX communication service to home-based and other small-scale businesses. This gives them the opportunity to project a more established and professional picture of their business, and lets them expand their customer reach by simplifying the communication base. Toll Free Number and Local Number: VirtualCallSystem provides a wide variety of toll-free numbers to its clients, from 800/866 extensions to the vanity numbers. A toll-free number is capable of presenting a bigger picture of the company in front of the clients. The callers can easily contact the company’s desk free of cost, no matter what location they are calling from. Other than this, the company also provides a local number for targeted city presence in all major cities. It helps in getting more clients through geographically targeted advertisements. Voicemail and Fax Delivery: This is actually the feature that makes VirtualCallSystem different from its competitors. The unique message delivery feature enables companies to listen to their voicemails, sent over in MP3 format, and read faxes delivered in PDF formats directly to the chosen email ID. This eliminates all the hassle involved in the traditional methods of delivering messages. Customized Main Greeting: In order to add a feel of a big company to your business, you can find the feature of customized main greeting really handy. You can easily set up a customized message to inform the respective callers about their options, like reaching a particular department or accessing useful information. Unlimited Extensions: This feature enables businesses to set up particular extensions for every department or employee. Each of these extensions can be given a particular message, as well as voicemail delivery settings. Call Forwarding and Blocking: Also known as a find me follow me feature, the call forwarding feature enables the company to keep a tab on phone calls and never miss one. The phone system can be made to follow the call-receiver anywhere around the globe. Call-blocking features provide the power to block a particular number of calls coming from a particular area code on the local and toll-free lines, thereby avoiding time wastage on unwanted calls. VirtualCallSystem provides an easy web-based administration and management of PBX services. No proprietor needs to be a tech wizard to operate the entire setup. The interface is extremely easy to use, no matter whether you’re a tech-savvy operator or a complete layman. With the online system, you and your colleagues can keep track on calls by viewing call details, changing the call routing, listening to voicemails, viewing faxes, going through account transactions and controlling many other features. The real-time interface enables you to view all details and make changes in real-time. 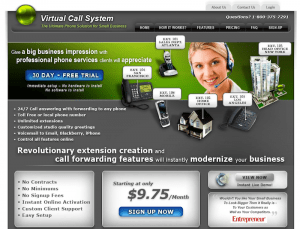 Virtual Call System also offers an online interface with all of their business phone plans and a proprietary setup wizard to help phone users get up to speed with their VoIP phone system. As far as the pricing policies are concerned, VirtualCallSystem can be considered as a budget service provider offering top-notch telecommunication services. The company offers three different kinds of plans to its customers. The Starter pack starts from a nominal charge of $9.75 per month and includes 100 free minutes per month, 5 extensions, one toll-free or local number and all features. Any additional minutes are chargeable at the rate of $0.058 per minute. The Gold package starts from $38.95 per month and includes 1000 minutes for a month, unlimited extensions, four toll-free or local numbers and all the features. Minutes over the count of 1000 are charged at $0.048 per minute. The Platinum pack is priced from $78.95 per month and provides 2500 minutes per month (additional minutes for $0.038 per minute), unlimited extensions, six toll-free or local numbers, and all other regular features. The company also provides a free thirty-day trial service, which includes 15 minutes of calling only. For customer service support, VirtualCallSystem provides complete support via telephone from Monday to Friday, between 9 a.m. to 5 p.m. One can also reach the support staff through live chat, in the same time period. Moreover, the FAQ section also provides ready solutions to some most commonly experienced problems. On the whole, VirtualCallSystem is one of the most reliable, economical and efficient telecommunication service for small-scale businesses and entrepreneurs. The features, ease of use, pricing plans and customer support, everything collates together to make VirtualCallSystem one of the best VoIP providers in the business.